My route to professional guitar repairs started in the traditional way, as a Fine Art student and a founding member of short-lived Punk/Skiffle band Ritzun Ratzun Rotzer. Over a period of 2 years, in the mid 1980’s, armed only with instruments found in skips and a breathtaking naivety, we managed to play gigs the length and breadth of the UK, record 2 sessions for Andy Kershaw, make a shambolic live appearance on the legendary Channel 4 music programme, “The Tube” and record and release our own 4–track 12” E.P. which was played on John Peel’s unmissable radio show. After the demise of Ritzun Ratzun Rotzer we formed another ridiculously named band, Ket Kolomper, and recorded our second 4-track E.P. (this time on CD), which was played on Mark Radcliffe’s show and rather bizarrely on Steve Wright’s show. We also toured as support band to The Wedding Present and Cud. 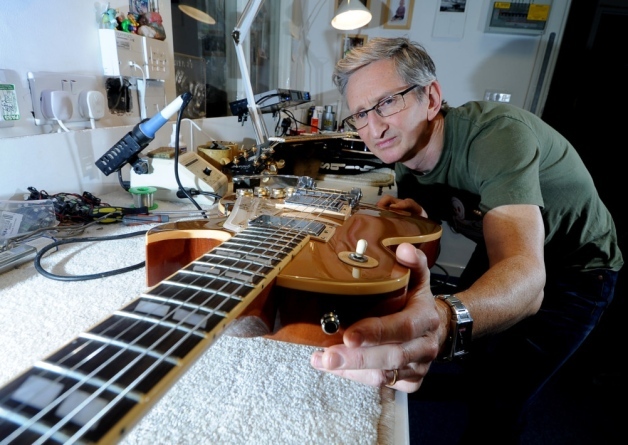 It was as Guitar Tech to Leeds-based Cud that I first developed an interest in guitar repairs in 1988 and this led to a full-time career as a touring Guitar Technician. Over the years I have toured extensively with a vast number of bands, including Richard Hawley, Duane Eddy, Pulp, The Cure, Nick Cave and The Bad Seeds, Embrace and Joe Strummer to name but a few. Travelling the world, I worked alongside, and learnt from, the finest Guitar Techs – David Bowie at Glastonbury, REM at The Isle of Wight and Iggy Pop at The Fuji Festival in Japan. I still tour selectively to this day. Around 1998 I was lucky enough to meet the highly skilled and generous repairman John White, who effectively took me on as his apprentice. I subsequently spent many happy hours in his workshop, asking 100’s of questions, watching him at work, honing my skills and soaking up as many tips and trade secrets as I could. Armed with this newfound knowledge I decided the time was right to open up my own guitar repair workshop in Leeds. I’m proud to say that Single Coil Guitar Repairs was the result and, despite several location changes over the years, I continue to this day to offer what I hope and believe to be the finest in guitar repairs.